Spanish Civil War Battles is a wargame system for simulating battles of the Spanish Civil War. The rules are divided into two sections. The first part consists of the standard rules, which apply to all the games in the series; the second part consists of the exclusive scenario rules, each of which applies only to a specific battle. In Spanish Civil War Battles, one player controls the Republican units, representing the Loyalists, Anarchists, Communists and various International Brigades. The other player controls the Nationalists, including Franco's army as well as German and Italian facists. 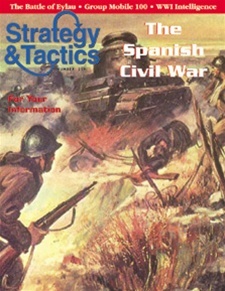 The two games in this issue of Strategy & Tactics are Guadalajara and Peñarroya. Scenario special rules may supercede the standard rules.